Set in the world of the Half-Continent-a land of tri-corner hats and flintlock pistols-the Monster Blood Tattoo trilogy is a world of predatory monsters, chemical potions and surgically altered people. Foundling begins the journey of Rossamund, a boy with a girl's name, who is just about to begin a dangerous life in the service of the Emperor. What starts as a simple journey is threatened by encounters with monsters-and people, who may be worse. Learning who to trust and who to fear is neither easy nor without its perils, and Rossamund must choose his path carefully. Review: This book was a refreshing read. It's certainly very interesting. The world that Cornish has created is very similar to the one Westerfeld created in Leviathan. I really enjoyed how detailed his world was. The book is described as being 434 pages long, but only 312 pages of that is the actual story. The other 122 pages are GLOSSARY. That tells you how crazy detailed it was. I did feel like this book was a warm-up to future stories. There was actually very little interaction with monsters. Instead of focusing on one main storyline or idea, this book touched on every single aspect in this world while following a loose plot. This tells me that the next book should start getting more deep into the flash-boom-pow of the series. At least, I hope so. 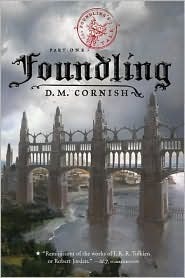 If you liked Westerfeld's Leviathan then you'll probably really like Foundling. However, be prepared that this book is only a jump off point for the rest of the series. If you're not looking to invest in the whole series, I wouldn't read this book. HA! I just read this book yesterday, and now my little sister is reading it! I highly enjoyed it - so unusual! My wife and I both picked this one up a number of times at the bookstore...intrigued. We finally picked up a copy, but haven't read it yet. Thanks for a nice review. Looking forward to diving in. Nice review! I just finished reading it. I have some complaints with it, but there's no denying the worldbuilding done by Cornish here.